As any aquarist will tell you, taking care of an aquarium goes far beyond feeding your fish. There are many ways to improve both the look and quality of your aquarium for its inhabitants. One of the best things you can do to improve your fishes’ habitat is to include live plants in your aquarium design. As Pennsylvania’s aquarium design experts, we specialize in helping clients with every aspect of their aquariums, from design and installation to maintenance, we do it all. Through photosynthesis, your live plants will increase the oxygen and decrease the carbon dioxide in your aquarium. This will create a healthier and more beautiful environment for your fish. Algae eaters and filters help with algae build up, but there’s nothing better than live plants to keep algae at bay. This benefit may seem obvious, but it is one of the biggest perks of live plants. They simply look better than artificial plastic plants. You’ll love the extra movement and life they add to your aquarium. 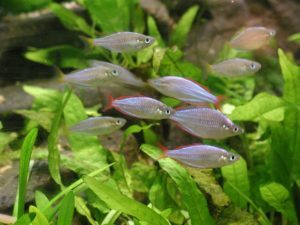 The more you do to mimic the environment from which your fish originate, the happier they’ll be. It’s probably a safe bet that the stream or ocean they’re native to doesn’t have plastic shrubs, so why should their new home? The following live plants are all great options for a freshwater aquarium. At Armco Aquatics, we utilize these along with many others in our commercial and residential installations. Java Moss: This plant is low maintenance and looks great on driftwood. African Water Fern: Use this fern almost anywhere in your aquarium. Fish love to use it as a hiding place. Cryptocoryne Beckettii: Adds a nice pop of color with its red stems. Hornwort: A bright green fern-like plant that can grow up to 2 ft tall, Hornwort will add great texture to your aquascape. Vallisneria – This eelgrass can grow up to 6 ft tall and its thin leaves sway beautifully in the water. Sagittaria – This low maintenance bog plant is great for your aquarium’s foreground as it only grows to be a few inches tall. Hygrophila – A canary in the coal mine, this plant will lose its leaves if your tank water needs to be changed. Looking for a Pennsylvania Aquarium Installation Expert? As the premiere aquarium designer in Pennsylvania, our team is responsible for more than 125 aquariums. If you need a team to help you with your aquarium needs, no matter how big or small, Armco Aquatics can help. Give us at a call at 1-877-ARMCO11 or contact us today.